Now that January is over I'll be giving my weekly spending average at the end of this post. My plan is to give a rolling average weekly total at the end of each month. I only had one stop this week. I really didn't need a whole lot. I mostly stocked up on produce, dairy and a little meat. I went to Winco and here is what I bought.. The veggies: spinach, kale, cabbage, grape tomatoes and mushrooms. The fruit: apples and bananas. I still have oranges from my last purchase of an 8# bag. 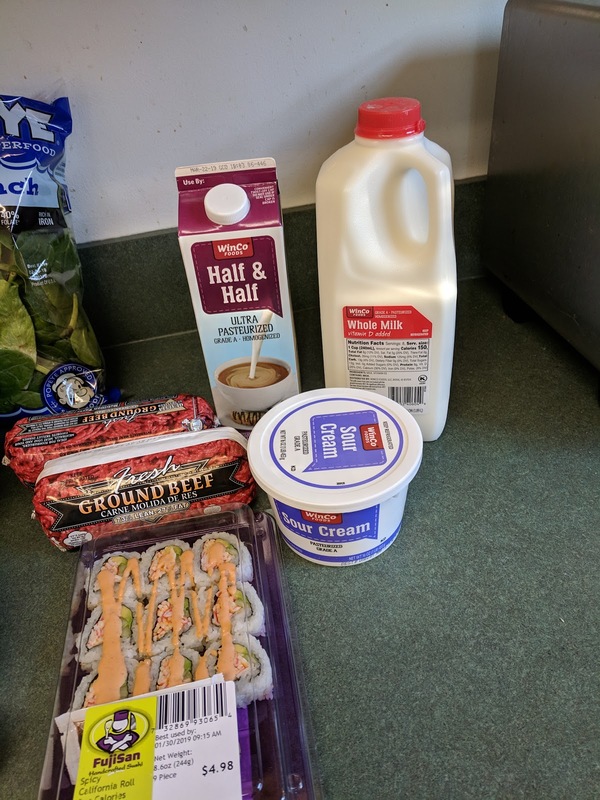 I picked up the weekly half & half and milk. I also got some sour cream and ground beef. The ground beef was on sale for $2.48 for 1# chubs. Not as great of a deal as it was the last time I bought these, but not a bad deal either. I also picked up some sushi. Hubby and I love sushi so it's a nice treat. 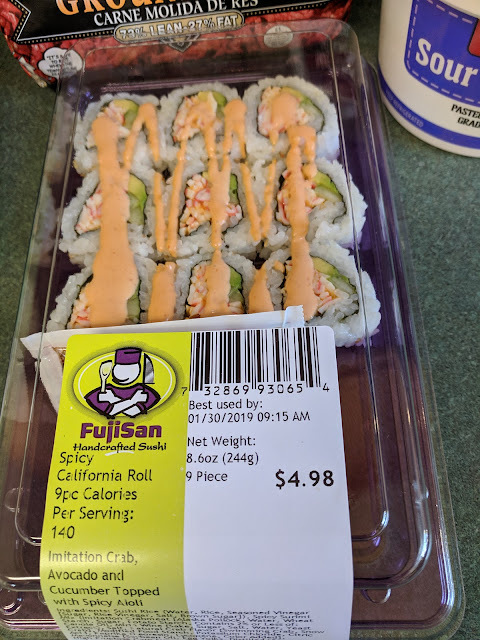 Typically I stay away from grocery store sushi because it's just not that great. However this brand that Winco sells is quite good, all things considered. It's not as good as going to a sushi restaurant, but pretty close. That was the extent of my shopping this week. I have shopped 5 times this month (since the beginning of January) and spent a total of $369 on groceries. I do have quite a few things that need to be used, still, plus all my home-canned and frozen items from last year's garden. This month, I'll keep working on targeting those things in meals and also on using some non-food items up. 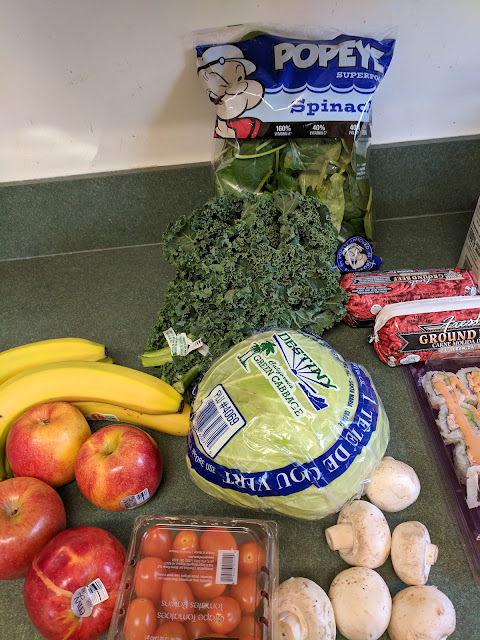 I will continue to buy as much produce as my husband cares to eat, as he has recently lost 77 pounds and is still losing, slowly, but surely. I've noticed the price has been steadily rising, as is common this time of year, so will be using lots of the preserved veggies when I can. We eat home-canned green beans several times per week, for instance. It's always fun to see what other people buy, and I enjoyed your post. Hi Becky! 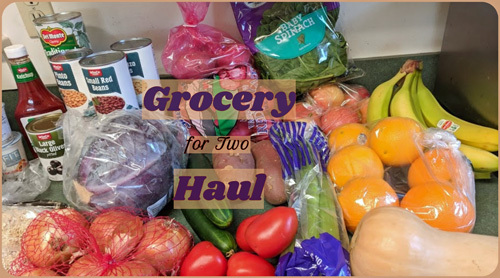 One of my daughters did a January pantry challenge for herself. Congratulations to your husband for such an amazing weight loss! That is fantastic. I'm big on fresh fruits and veggies in our diet. I visited your blog and really enjoyed it. I'll be back to read more.